Some of your toughest competitors are ex employees. We've seen it with Scandinavian driver manufacturers where, in the wake of corporate takeovers, small teams of originals left and regrouped. We've seen it with Krell's takeover leading to Dan d'Agostino the brand. Exogal fronts ex Wadia men. To arrive at today's review subject, Bricasti reunited Brian Zolner and Casey Dowdell who'd worked for Lexicon as global sales manager and DSP software engineer respectively before Harman's takeover caused eventual factory closures for the Mark Levinson and Madrigal brands. Tim Thompson, the 'ti' in Bricasti, came from Kurzweil. He created some of their first-year hardware, then returned to Kurzweil. With the principals' roots in advanced pro audio, Bricasti first launched a no-compromise stereo reverb processor for recording engineers. Even without this briefest of history lessons, one look at a black Bricasti spells Mark Levinson the brand to the cognoscenti. That closes our circle with the lead-in sentence. Against a savvy pro audio background, one expects and gets fully balanced true dual-mono circuitry (executed in the digital domain with one stereo AD1955 chip per channel); AES/EBU and BNC; scaleable gain via internal jumpers and trim pots; direct digital synthesis clocking; and operational amplifiers in certain junctions. Given Casey Dowdell's software design chops, one also expects and gets a plethora of selectable digital filters, in fact nine linear phase, six minimum phase and three DSD post filters. As such, Bricasti have stern advice. Use native mode signal feed exclusively. Let their 384kHz PCM slash DSD128 (DoP) converter handle its own 8 x ΔΣ oversampling. Don't upsample inside your own media player or CD transport. Finally, Massachusetts-based Bricasti outsource partial hardware engineering to Connecticut's AeVee Labs founded by ex Madrigal chief engineer Bob Gorry. 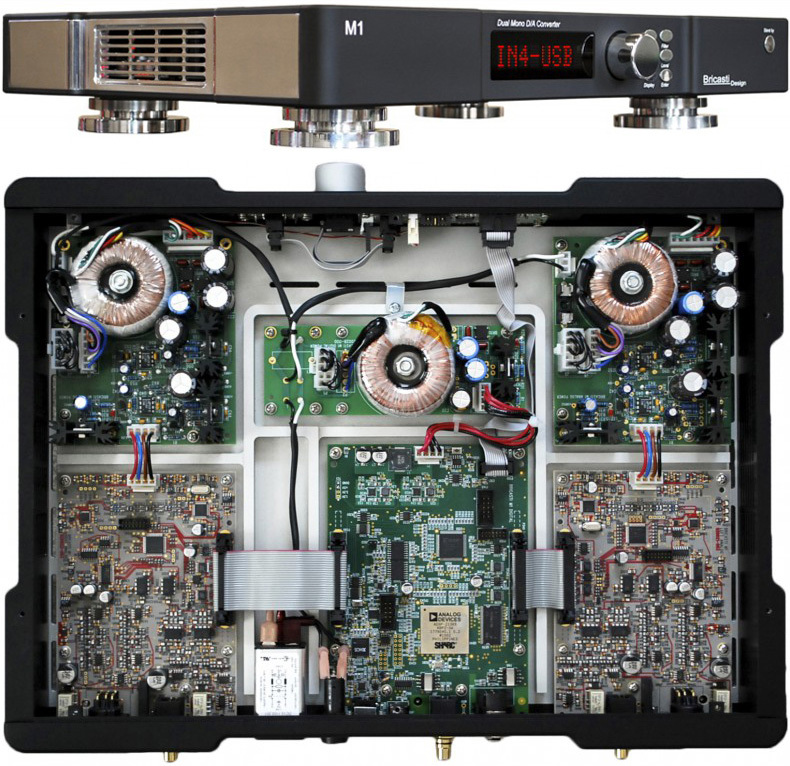 Hence the M1 DAC contains even more super-competitive "ex power". Message to the wise? Keep your employees happy; don't go out of business; don't get taken over. Cough. * Not quite. Matt Esau at their UK import house mentioned further pending products still within the hifi realm. This shows how Bricasti for the moment focus on building out their consumer appeal before returning to the recording studio. The M12 combines the M1 SE with "high-resolution analog gain; analog level control over a 90dB fully balanced resistor ladder embedded behind the DAC's I/V stage; and XLR/RCA pass-thru analog inputs. Like the M1, the M12 is a dual-mono design with 3 power supplies and separate left and right analog power supplies and digital and analog processing. Its network interface allows it to be seen as a DNLA device to play or stream to. The M12 also features a pure analog DSD converter. Any post-processing noise filtering and level adjustments are done in the analog domain." Bling Crosby? As shown, the Limited Gold really is gold via 40-micron luxury plating on its chassis, footers and remote. Rather than a crass nouveau-riche aim at Dubai, Moscow and Mumbai, Bricasti claim a unique sound for their gold, remote control excepted. Their materials and mechanical refinements continue with larger Stillpoints footers, internal Stillpoints isolators for their Arlon substrate PCB, point-to-point wiring and upgraded power capacitors. Even the standard version already has the CNC'd-from-solid aluminium chassis and durable laser-etched markings. It's also got the same transformer-isolated digital input stage with linear power supply; the Analog Devices Sharc-based DSP filtering, clock sync and display control; and the fully differential gain stage with high slew-rate opamps followed by a discrete transistor output buffer. On XLR and RCA, output impedance is 40Ω, with dynamic range of >120dB. Full-bandwidth THD is an ultra-low 0.0006%. The 5-layer red display's menu can show and/or control input selection, incoming sample rate, processed sample rate (usually 352.8kHz for 8 x 44.1kHz Redbook or 2'822/5'644MHz for DSD), error tracking, internal operating temps (0° to-40°C), phase inversion, 3-stage brightness including sleep mode or off, filter selection, volume and mute. Async USB 2.0 is electrically isolated to disrupt computer-induced noise transfer. Power consumption is 28 watts, 6 watts in Brussels-unhappy standby. Dimensions are 17" x 12" x 2.5". Weight is 12lbs. 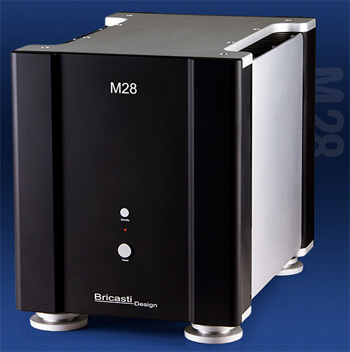 To wrap our intro, Bricasti slot themselves into a growing line of prosumer attempts like Antelope Audio, Benchmark Media, Berkeley Audio Design, Bryston, dCS, Manley Labs, Meitner, Merging Technologies, Nagra, Weiss & Co. The Madrigal, Mark Levinson, Lexicon connection parks them at its most ambitious end. With the Gold's nod at Fort Knox not the recording studio, that comes to $15'000 in green currency or 5K more than the otherwise already Special Edition in black. Judgment about gold's actual impact on sound not shekels is reserved to those with A/B ops. I was simply the short-term beneficiary of a UK distributor's shiniest floor demo unit. When someone parks a Ferrari in your drive way and hands you the keys for a weekend, you don't bloody decline. You take a mini vacation and hit the road. Vroom.